Next time I came across one was when Frank Potts was giving a short talk at Laurie’s G4G event – he’d pulled together a bunch of three-piece burrs to talk about, including the Minotaur Burr which he admitted he’d designed as a specific challenge to the Hordern / Dalgety puzzle classification system, being both an interlocking solid (burr!) and a route-finding puzzle. I know it’s definitely not the only puzzle that can be classified several ways, but I loved the fact that he’d designed it specifically to challenge the categorisation. In response to a request, Frank brought along a copy of the Minotaur Burr to an MPP and several of us enjoy playing with it. Fast forward some considerable time (months!) 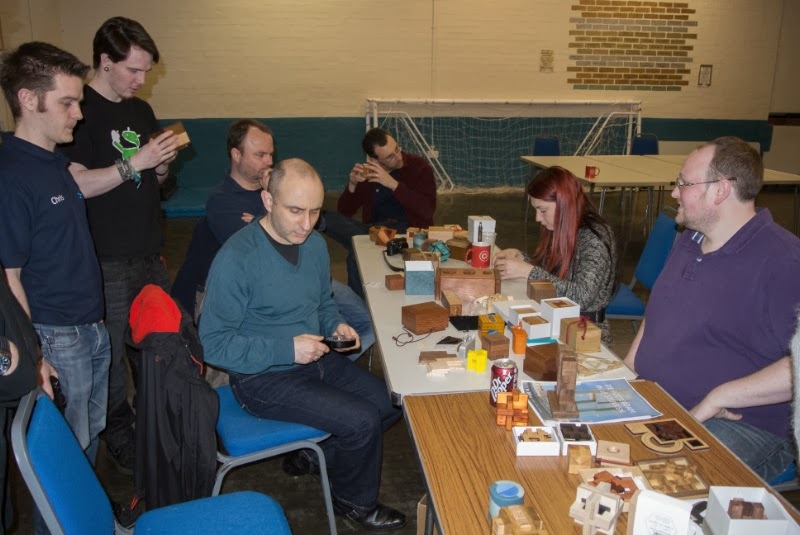 and Frank mentions that it might be time to get rid of some duplicates from his collection – a few bits and bobs appear on Ebay and then a Minotaur Burr appears on Cubic Dissection’s marketplace being sold by the Potty one. 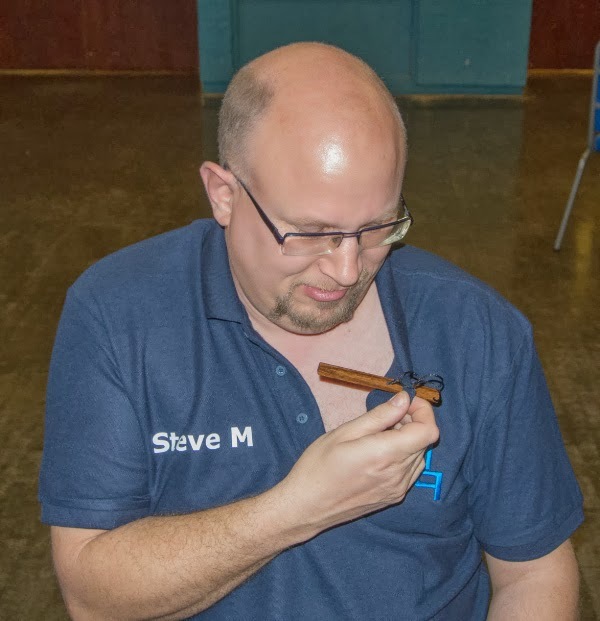 So I bid early and I bid good…and over the course of the week I find myself needing to increase my bid a little – apparently I’m not the only one lusting after one of these – damn and blast! 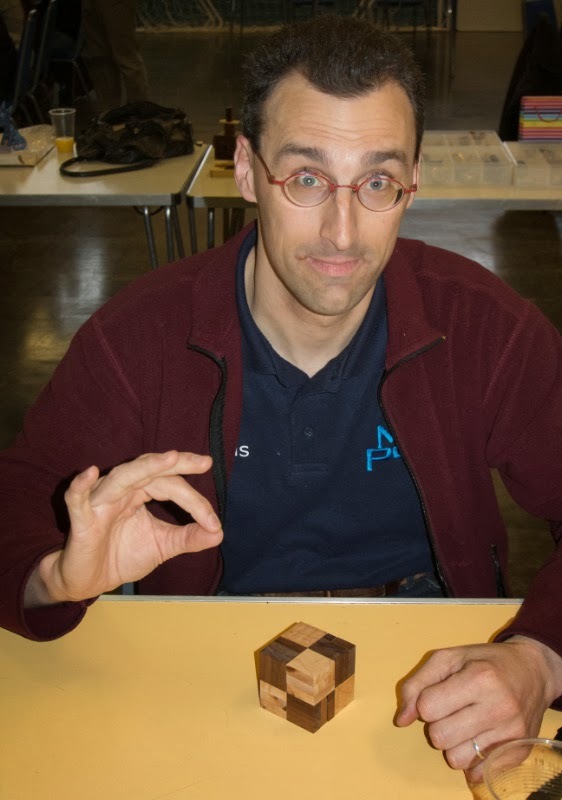 But I manage to stay on top and my Minotaur Burr arrives while I’m out playing puzzles at MPP13. My copy may well just be an unnumbered artist’s prototype, but the fit is perfect and the movements are crisp and clean. Assembled, it looks just like a pretty large 3-piece burr. 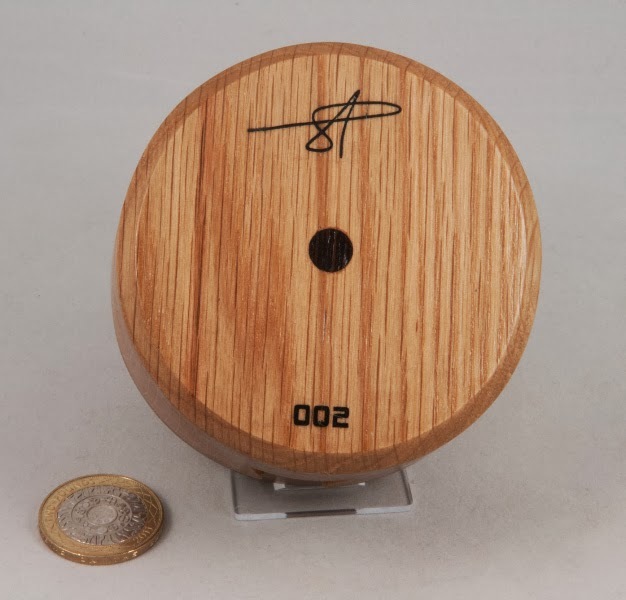 Pick it up and you realise immediately that it’s quite a lot denser than it should be – it’s not a simple wooden burr! Start moving the pieces and you realise there’s a maze or two inside there that you’re negotiating. You’re given a glimpse of the insides pretty soon after you start taking it apart and the aluminium mazes set this puzzle well apart from any ordinary three piece burrs. 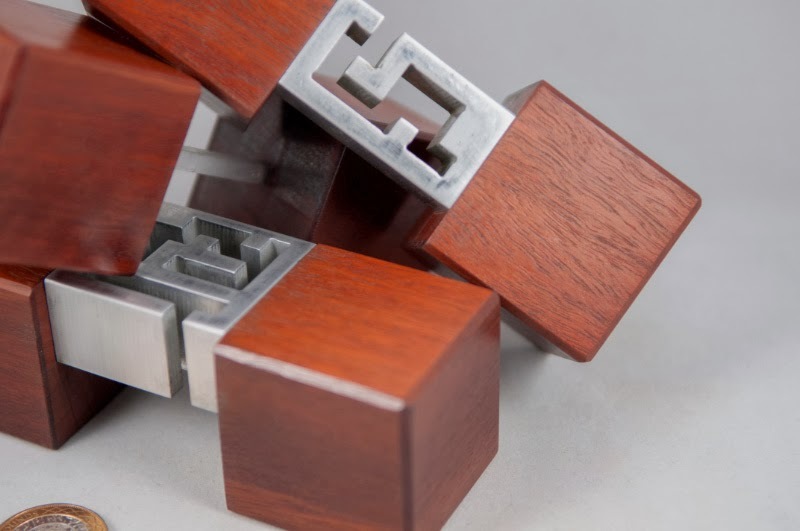 Navigate all the way to the end and you can remove one piece with a clear acrylic rod joining the two end pieces before the two maze pieces are freed. 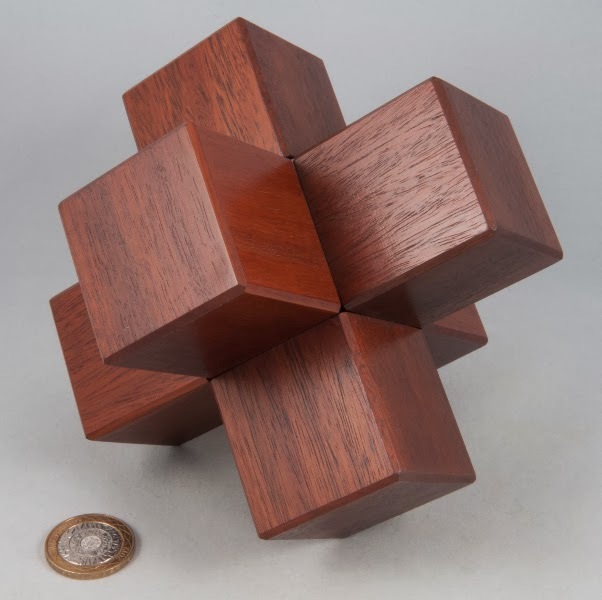 It’s not a hugely challenging puzzle, but it is surprising and fun to work through – and I love Frank’s story behind the design. I’m well-chuffed to have finally managed to add one of these to the little collection. Cheers Frank for agreeing to part with one of them! Right, so the weather in the UK has been pretty foul lately, so our visitors from further afield had the joys of flying into some rather unpleasant weather on their way to MPP13. Louis described the flight into Birmingham as “interesting” and “a bit bumpy” and Isabel and Taus had the joys of a couple of go-arounds before their pilot managed to put it down on the black stuff in London … and then travelling to Warwick on the Saturday, Shane ended up spending 5 hours in traffic on the M40 – and in spite of all that, 16 of us turned out for MPP13. Louis had flown in the night before, as usual, so we spent a couple of hours chatting and puzzling. 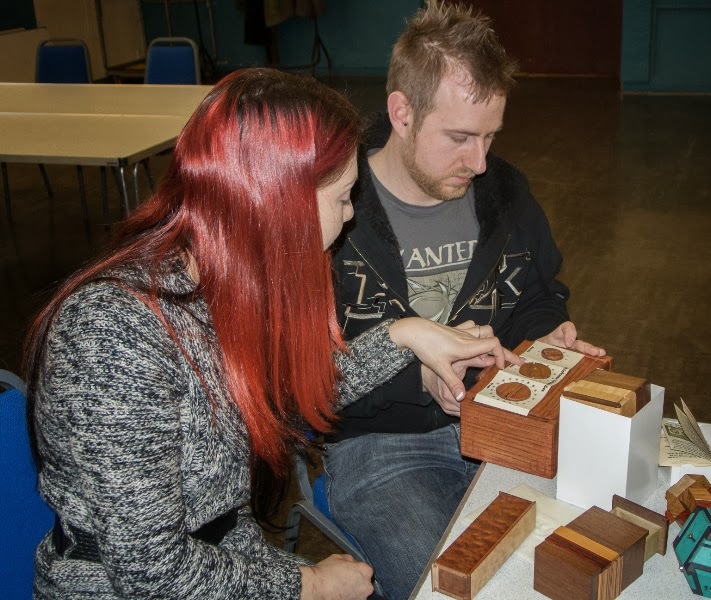 He’d brought over a new prototype of our potential exchange puzzle for IPP34 [I’m very chuffed that he’s agreed to be my exchange assistant this year!] 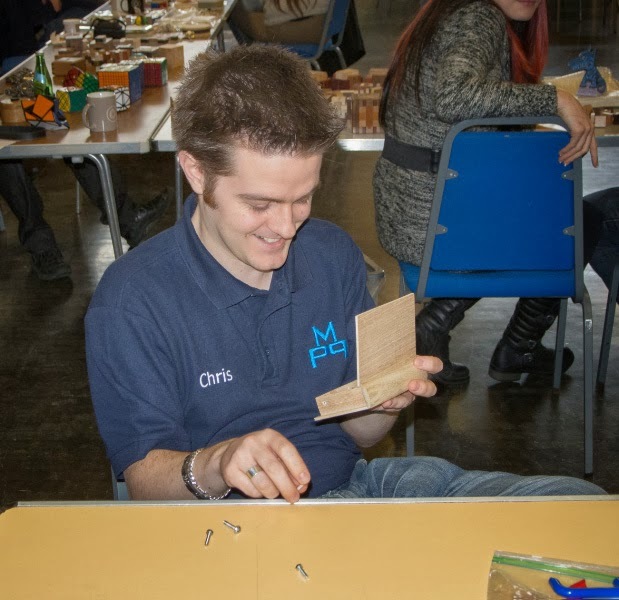 and I was invited to have a go on it … now even though I was pretty sure I knew how the guts of the mechanism worked, it still took me a good 10-15 minutes to get it open – and he’d just tweaked a couple of things! We chatted about some ideas he had and some suggestions from Wil, and I suspect that it’s going to turn out rather nicely. Sometime after midnight I crashed, leaving Louis to solve some more puzzles and line them up, solved, on the desk in the study … it’s a ritual – and there are generally several things solved in that time that I’ve been unable to solve for ages! After some breakfast the next morning we headed down to Warwick and found Nigel and Chris just about to head out. We’d only been at Nigel’s for a few minutes when the first wave of travellers from London arrived, so after we’d said hello to Taus and Isabel and Andy and Stephen, we all headed down the road to the hall … and fairly soon most of the gang was there, tables and chairs had been set up, kettle and coffee laid out and puzzles tipped out of plastic crates onto tables – and we’re ready for a full day’s puzzling! Neil had sent over a copy of his exchange puzzle for some road-testing and after I’d had it for a couple of weeks and singularly failed to find a solution for it, I’d handed it over to Nigel a couple of weeks before MPP for his thoughts… he duly brought it along having at least found an assembly, albeit not a colour-coded one, so it was passed around to a few of the guys to have a bash at. A couple of the new Revomaze R2 puzzles showed up and some of us who don’t have one had a bit of a play around on one, but they’re not the sort of puzzles you can have a casual play with and get any enjoyment or progress out of, and having seen the maze plate, I’d imagine that it’ll be an absolute brute to map out, unless there’s a design “feature” that lets you bypass most of the tricky section … they do look nice though. Kevin and I had both brought along our copies of Shane’s The Circle puzzle and quite a few of the guys had a go at one of them and I think most managed to open it … although I’m pretty sure they all opened my copy as Kevin’s had significantly tighter tolerances and as a result it gave a lot less of a clue as to what to do than mine does. The mechanism surprises everyone and most people ended up playing around with the mechanism when the puzzle was open to convince themselves of how it actually worked… it’s good! 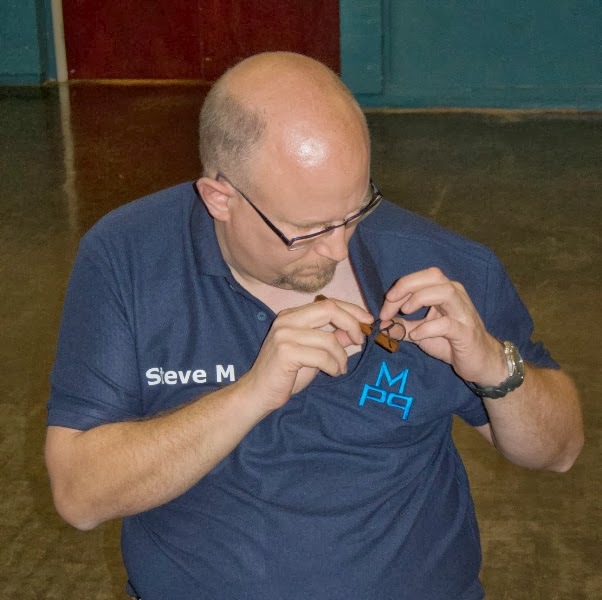 At one point Steve slipped into mischievous mode (I’m sure there’s an obvious remark, but I can’t think of it!) 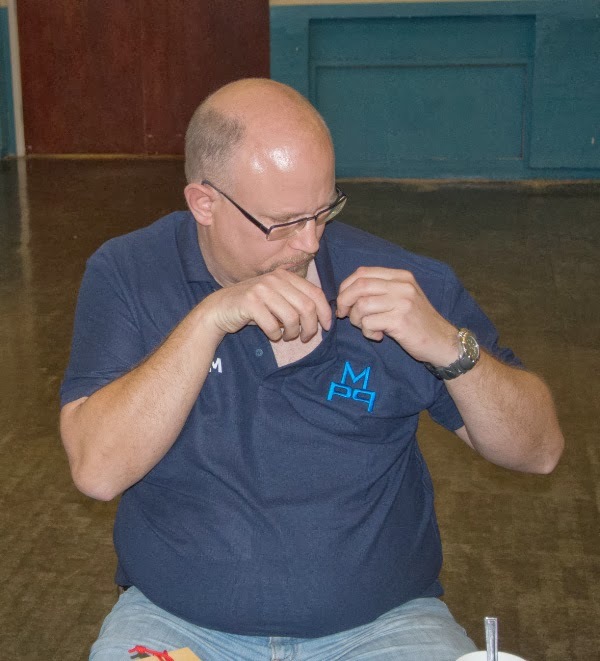 and introduced Stephen to the wonders of the buttonhole puzzle, by attaching it to the buttonhole on his new MPP polo shirt. “Unfortunately” that made it rather awkward for Stephen to work on removing it as he had to crane his neck and pull on his shirt just to be able to see what he was doing … and it would be cruel and mean and horrible to make fun of his attempts to free himself so I shall say no more of it. After he’d recovered from that ignominy he had a go on a Danlock that he hadn’t seen before and he and Andy ended up having a brilliant time trying various strategies along the way to solving it while receiving helpful chirps from the other side of the table – seeing puzzlers finding the various little “A-Ha!” moments along the way still puts a huge grin on my face. 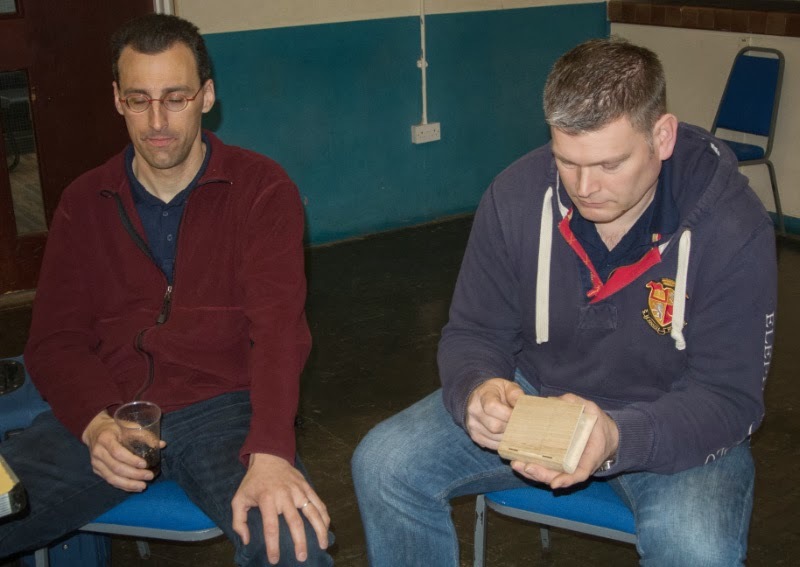 We vacated the hall at about 6pm and Louis and I headed back to my place for more puzzling [as luck would have it a couple of puzzling parcels had arrived while we were out! 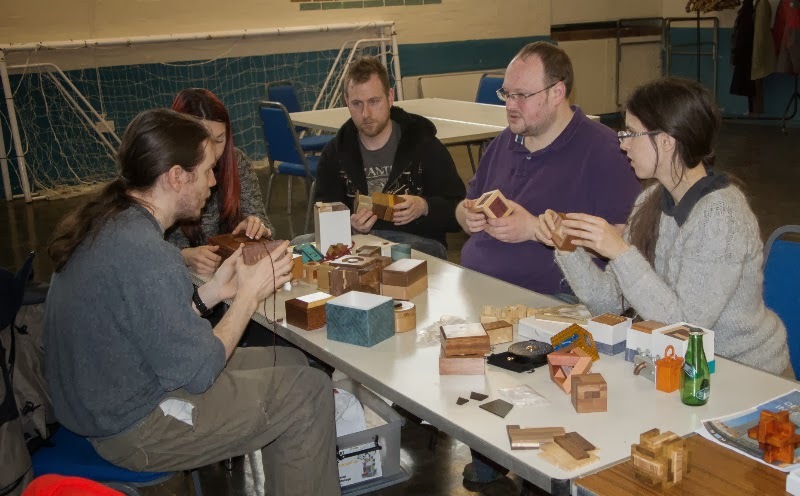 ], a bit of dinner and yet more puzzling – including some longer discussions about the potential changes to the prototype exchange puzzle and some thoughts on what we might be able to put inside the box … I now have some work ahead of me! Louis headed back to Eindhoven the next day, and the weather gods gave him a slightly more pleasant departure than his arrival had been – another fine puzzling weekend! Now to be honest, I wasn’t expecting to get very far as my fellow blogger Kevin had received his copy a little while ago and from his posts on FaceBook and his blog, he was finding it very tough indeed … ah well, might as well just have a little play with it then. 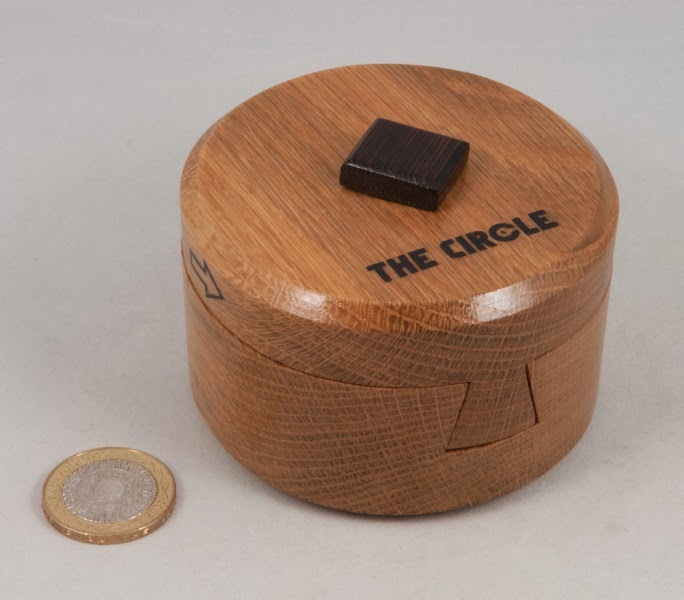 The round block has a clear dovetail going through the centre of it and the two halves have a tiny bit of wiggle to them, which makes you think they’re going to slide apart at some point. 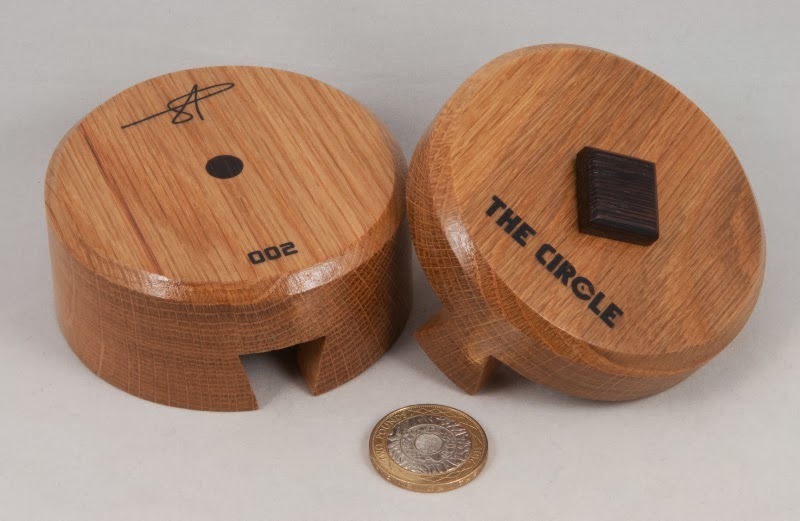 The top has a dark wooden rectangle stuck to it and there’s some lettering on the top (“The Circle”) and the bottom (Shane’s signature and the puzzle’s serial number – 002) and on the sides of the top piece are a pair of arrows pointing toward the front of the box. 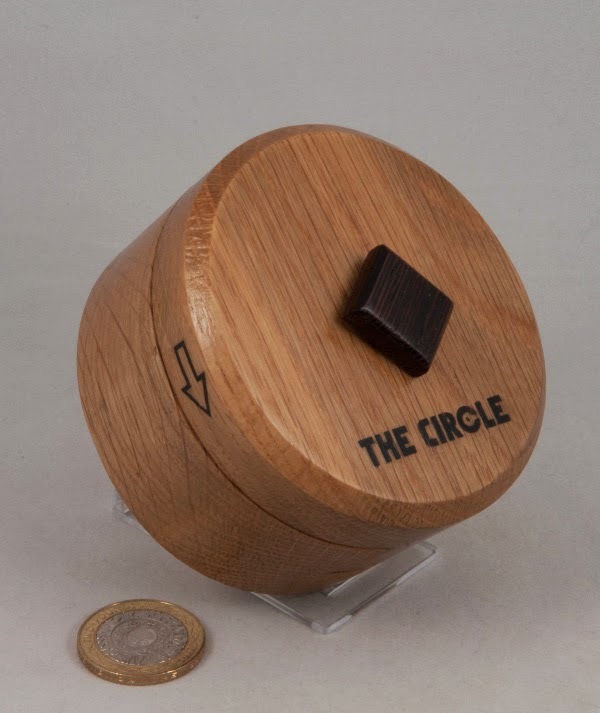 There aren’t any obvious things to try at first, but one thing strikes you as soon as you start playing with The Circle – the clanging noise coming from inside when you tap or shake the box from side to side. 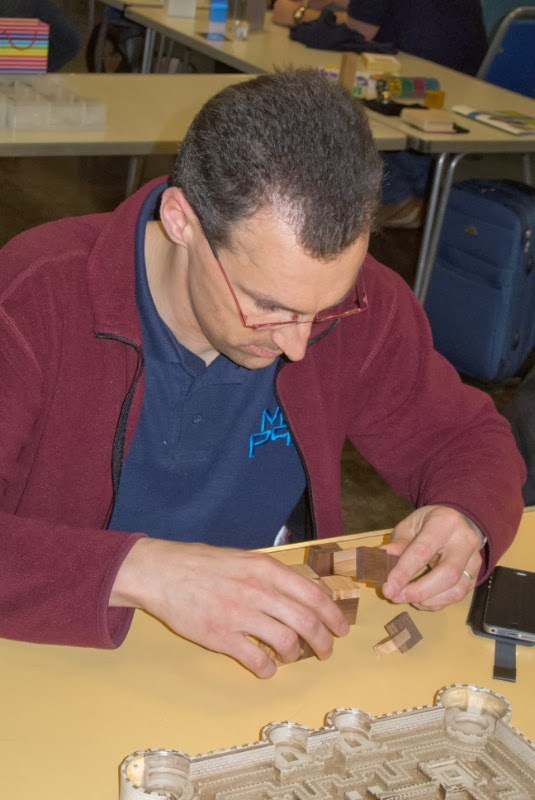 During the course of my solving, I became more and more convinced that when I finally opened it I was going to find the parts of a child’s rattle inside there – just to confuse me! After a little experimenting I managed to stumble across something interesting and that led me to the first “move”, which gave me a little more movement between the pieces, but only a tiny fraction more … clearly there was still a lot to be done. After a fair amount of pretty random attempts I resorted to some very careful exploration and spotted a few tell-tale clues to what might need to be done next – and after I’d experimented this way and that a little, managed to unlock the next little barrier, allowing another tiny lit bit of extra movement. Knowing that I’d be able to repeat the first few steps, I got a bit braver and began experimenting along a few different potential paths until I found one that gave me a huge amount of progress – letting the two pieces slide half apart – and letting me see the internal mechanism for the first time – and also releasing a couple of bits from the earlier lock onto the counter and thence onto the kitchen floor, where I managed to save them before the hounds got too interested in them. 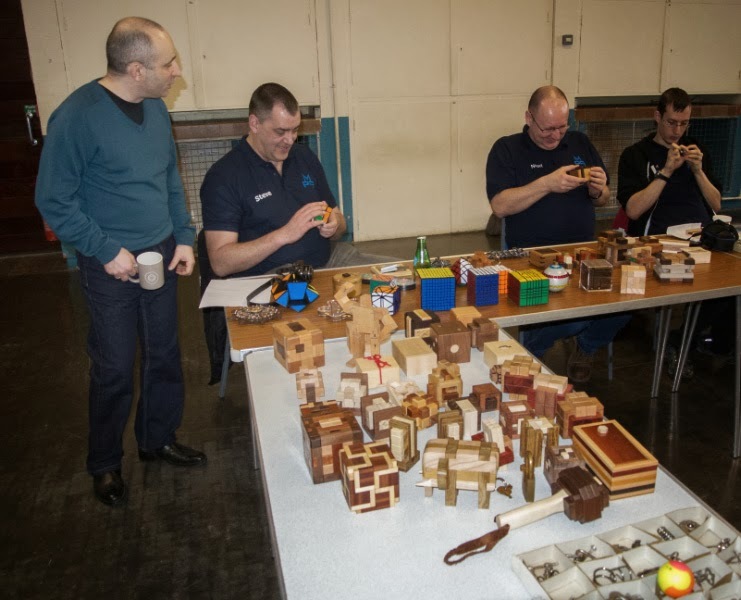 Having the puzzle half open was a real revelation – all of a sudden that weird noise made sense – and no, there wasn’t a kid’s rattle in there at all! I remembered Shane’s warning to avoid using my fingers on the mechanism and set to work on opening it fully – not too tricky once you’ve seen the mechanism and even easier when you can see one half of what’s going on in there … and with that, half an hour after starting it, I had it open and in bits on the kitchen counter – with a tremendous sense of achievement – it is a CRACKER of a puzzle! …until about 5 minutes after I’d sent the first email, which enabled me to send another saying “...just worked out the final bit of the puzzle - stand now assembled! 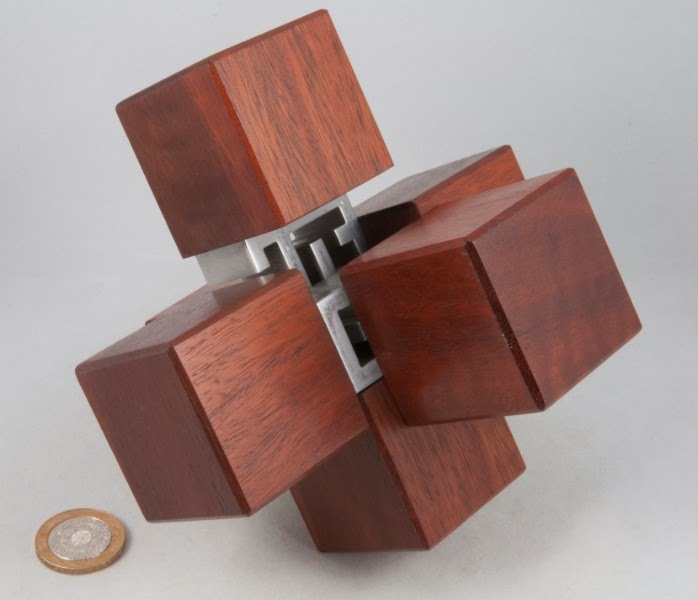 I'm an eedjit!“ It makes up a neat little stand for displaying the puzzle at an angle – a great touch! Shane, this is a seriously great puzzle! It looks good, the workmanship is spot on (including the sloppiness you put there deliberately!) and the mechanism is clever and confounding! Thanks for giving me a copy – I’m proud to add it to my little collection and I'll be taking to along to MPP to make sure a bunch of others can have a go on it too - because I'm pretty sure they'll like it too!